Though it is new in the hearts and minds of U.S. park-goers, the Salinas Valley is the site of an ancient history spanning 23 million years. 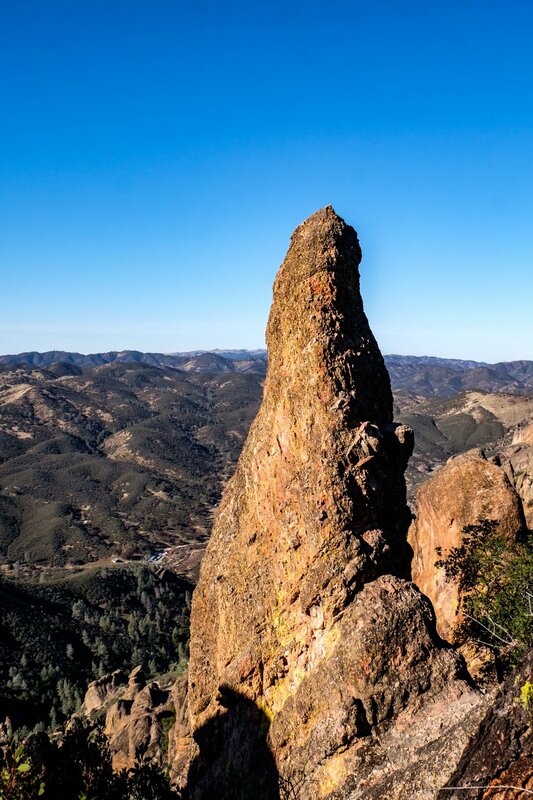 Over the course of that time, the "pinnacles" have migrated some 200 miles from their original home on the San Andreas Fault where the volcano that they were born from once stood. Today, that volcanic rock from the Pacific Coast Range has morphed to form monoliths, spires, peaks, cliffs, and other formations that jut out from the pastoral hills of the region. The park is split into east and west districts between which there are no driving roads connecting the entrances on either side. 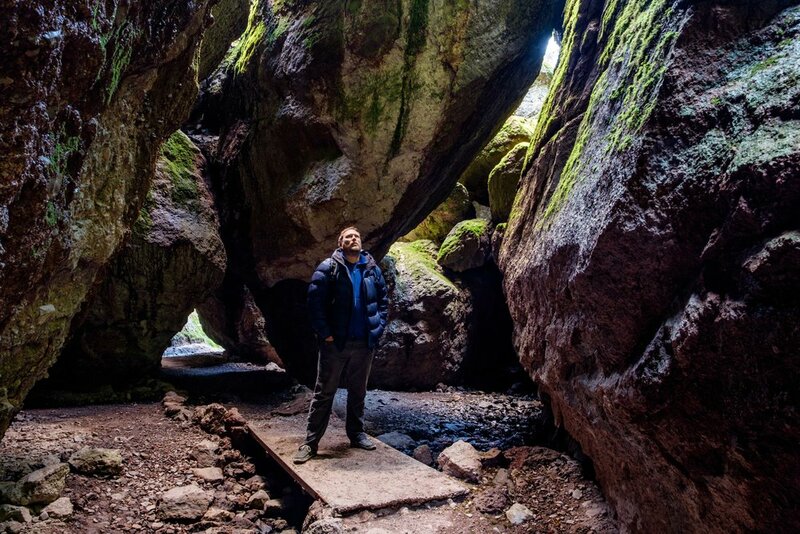 In the west district, there are rare and unusual talus caves – caves made up of fallen rock sandwiched in slot canyons. On the east side you will find the most interesting views of the formations along with broader views of the entire park landscape, the main park visitor center, and an established camping area. Both sides are beloved by technical climbers, day hikers, cave-goers, and bird watchers eager to catch a glimpse of the endangered California condor. While there are many adventures to have in Pinnacles, we are choosing to focus on just three – accessible to all people, of all ages, and of all ability levels. Being our last park page – 59 of 59 – we really wanted to highlight adventures that all can experience... as we see it, the true beauty and great triumph of our National Park System is that there really is something wonderful in each national park for every person to enjoy. 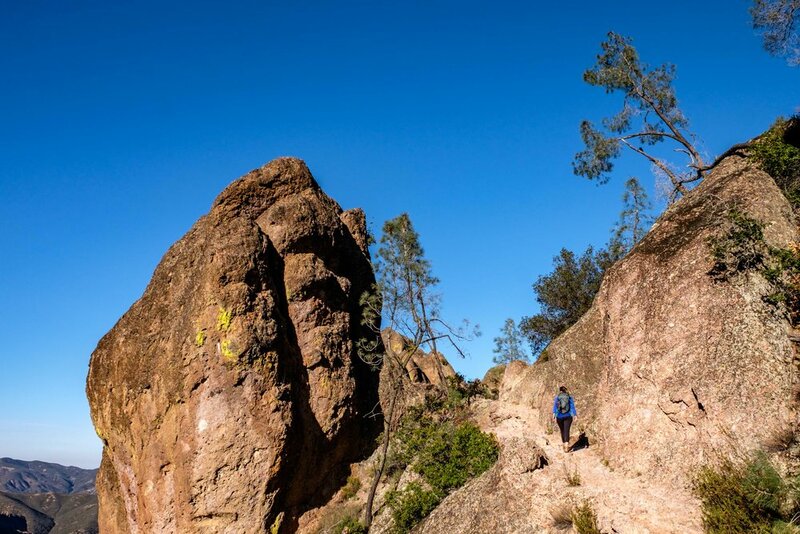 Pinnacles National Park is a hiker’s paradise. 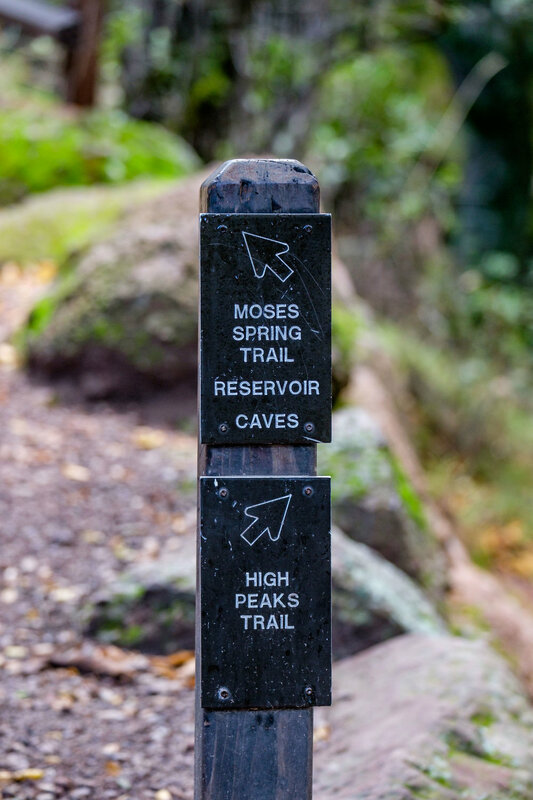 With 32 miles of established trails meandering meadows, talus caves, and colorful formations, there is a wealth to see just by strapping on your hiking shoes and heading out on foot. The great diversity of the landscape allows visitors to climb through boulders, trek uphill climbs, stroll on flat paths and along shaded creeks, and immerse in a vibrant river valley. Along the way you will find wildlife, sprawling views, and general peace and quiet. If all of that doesn’t get you to hit the trails, nothing will! A footbridge on the Balconies Trail on the west side of the park. Descending the High Peaks Trail on the east side of the park. The Moses Spring Trail in the Bear Gulch area on the east side of the park. Talus caves are an unusual feature and they are awesome to explore. These caves are not traditional in the sense that you are not completely underground the way you are in Carlsbad Caverns, Wind Cave, and Mammoth Cave, but comprised of fallen rock toppled upon canyons. That light that is allowed to stream in through the open ceiling accentuates the space between the large boulders that make up the cave networks. The two main talus caves to explore are the Bear Gulch Cave on the east side of the park and the Balconies Cave near the west entrance. There's our California condor! It looks tiny but it's huge! This is a birder park in a big way. The California condor is the most celebrated species in the park. It is the largest bird in North America with a wing span reaching up to 10 feet (think about how big that is for a second) and they can live up to 60 years of age. The raptors (vultures, actually) have had a troubled history and nearly went extinct in the mid-1980s due to poaching and destruction of habitat. At one point, there were less than 25 wild California condors on the planet – those were captured, underwent captive breeding through efforts of conservation groups and the National Park Service and were released in the Salinas Valley after hatching in captivity. Today, more than 400 California condors exist in the skies above Earth thanks to that successful effort. Bird ninjas want to see more than just condors, of course, and Pinnacles tees opportunities up beautifully. There have been 181 species recorded in the park since 1908 – prairie falcons, peregrine falcons, woodpeckers, ravens, roadrunners, golden eagle, the violet-green swallow, and many other species make a happy habitat at Pinnacles. How the park got its name: In 1880, the area where the national park is now was known as “the Palisades” until a newspaper article came out in 1881 describing the trellised areas as “the Pinnacles.” Further exploration of the area and additional marketing of it as a tourist destination helped the new name to stick. It has been officially known as Pinnacles since it was protected as a National Monument in 1908. A beautiful reflection at the reservoir found along the Moses Spring Trail. 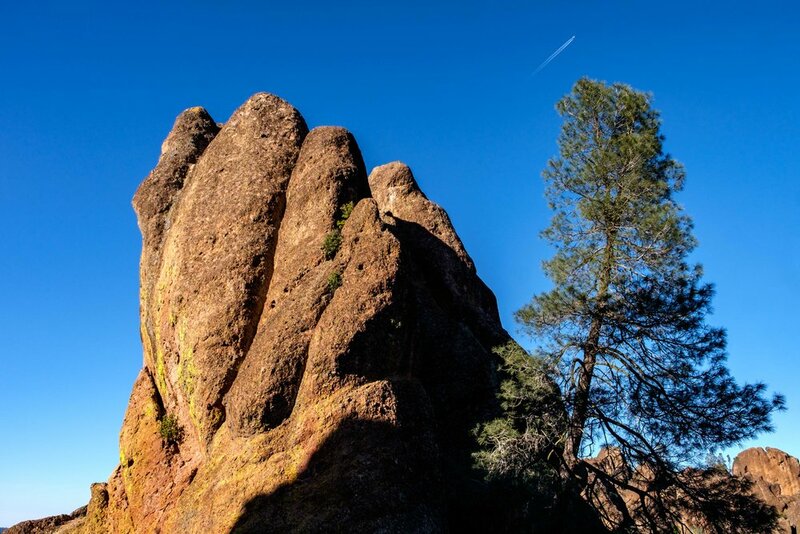 Iconic site in the park: The geologic formations known as “the pinnacles” are a series of volcanic and sedimentary rocks that have eroded over time to take the shape of colorful and ornate cliffs, crags, and talus cave formations that rise from a forested landscape. 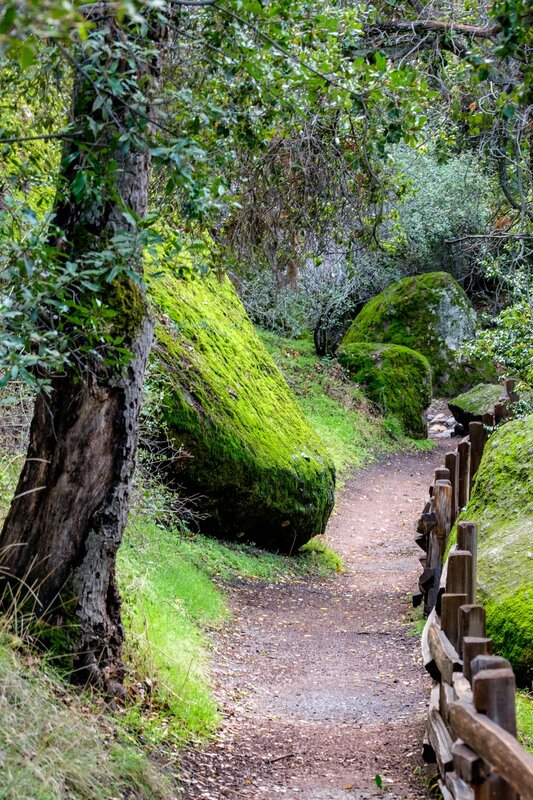 Accessible adventure: The Moses Spring Trail in the Bear Gulch area winds through 2.2-miles of easy out-and-back hiking at 500 feet of elevation. The adventure offers views of unique rock formations, talus caves, and a reservoir where hikers, birders, wanderers and the like can meet the pinnacles and see them reflected in a still body of water. This is a great trail for children and those looking for an easy stroll in the park. 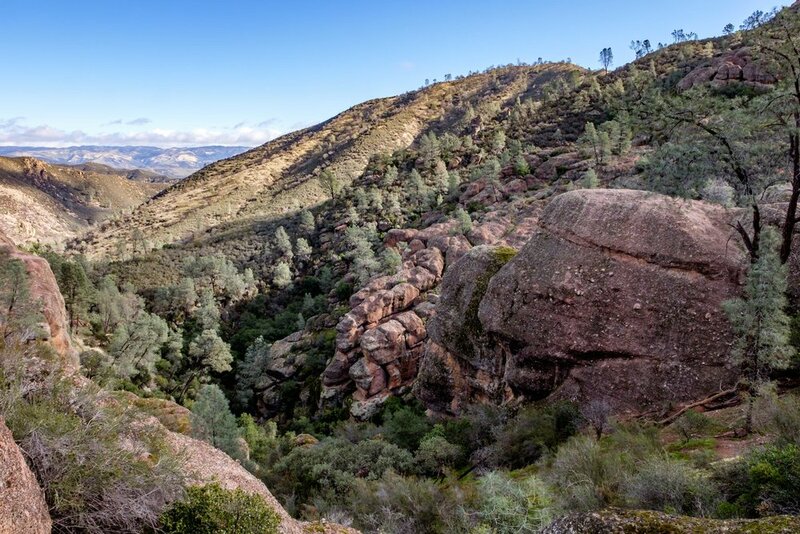 Big adventure: The 7.7-mile roundtrip High Peaks Trail to the Bear Gulch Loop Trail (2,125 feet elevation) crosses meadows and grasslands, through forests of sycamore, oak, and buckeye trees, and into the pinnacles formations. There are three trails in this network – the Bear Gulch Trail, Bench Trail, and High Peaks Trail – allowing you to choose your own adventure along the way. Keep your eyes fixed upward and you will almost certainly catch a glimpse of the California condor who call the area home. Look at this beautiful place! Sigh. 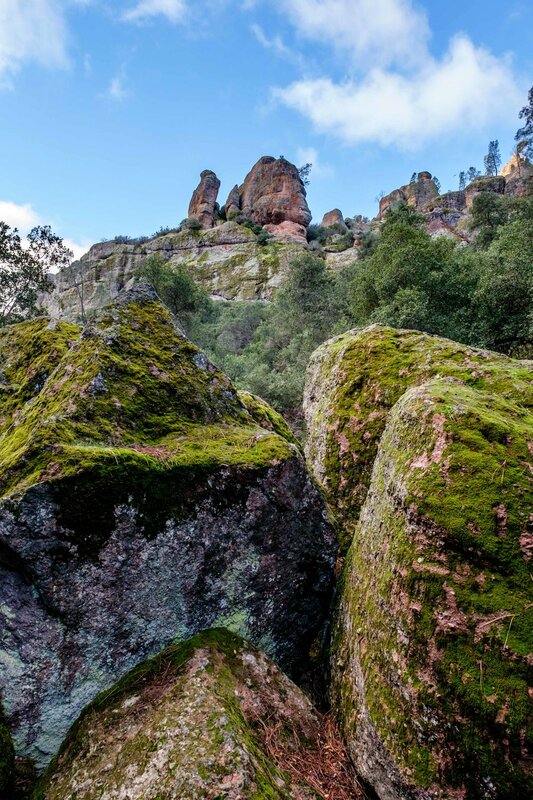 Pinnacles National Park is located about 135 miles from San Francisco in the Gabilan Mountains east of the Salinas Valley. American writer John Steinbeck grew up in the Salinas Valley and lived there until he went to Stanford University in 1919. The location inspired several of his works, one of them being East of Eden. There is no road connecting the east and west side of the park. A drive around the park perimeter takes about two hours. Services are scarce in the area as well, so gas up in advance! 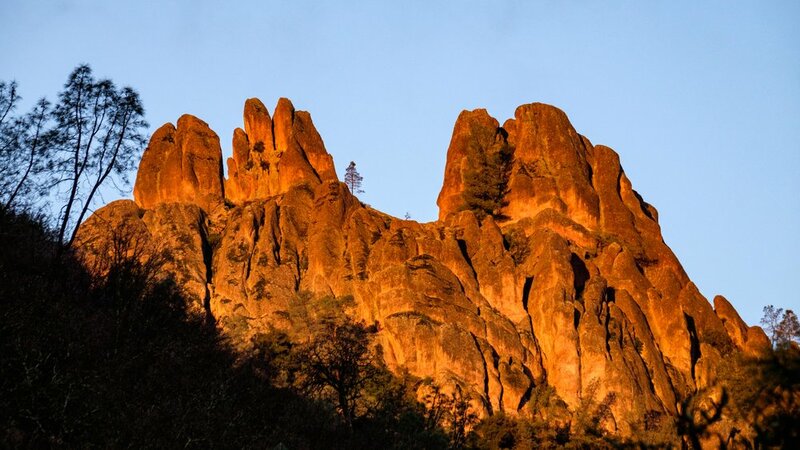 While many of the national parks have meandering scenic driving roads, Pinnacles does not. It is explored mostly along hiking, walking, and climbing trails. 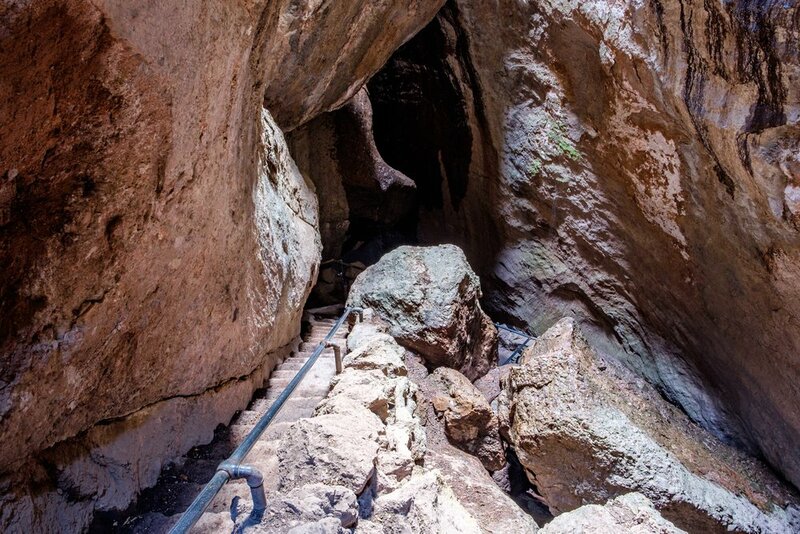 The talus caves in Pinnacles is home to 13 species of bat. This park uniquely offers ranger led night hikes where visitors can explore the park and see its nocturnal creatures, including bats and owls. Added bonus: because of its inland location, there is little light pollution making it a prime place to view the night sky. There are more than 400 species of bees living in the park – the largest unit of measure ever studied in one area. Most of the species do not live in hives. 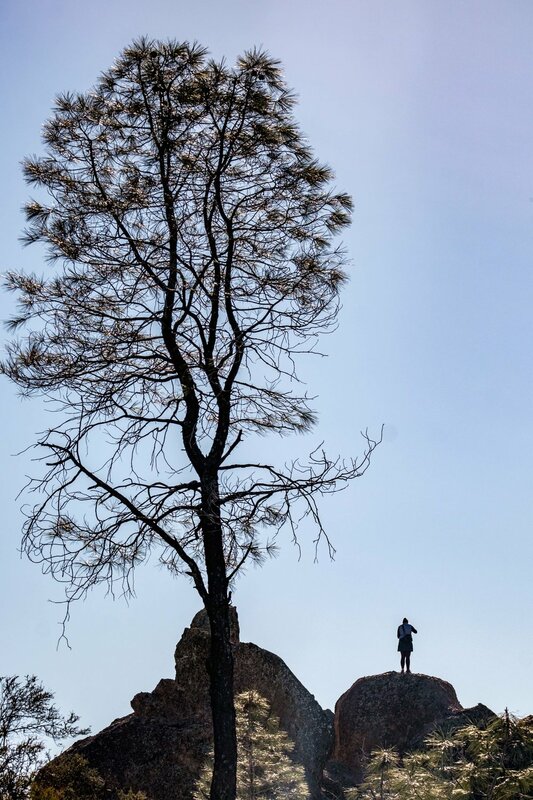 The pinnacles rock formations are beloved by technical climbers. There are hundreds of climbing routes on both sides of the park. There are approximately 10 earthquakes per day in the area, though they are rarely felt. Geologists estimate that the pinnacles formations move at a rate of about 2-miles per year. 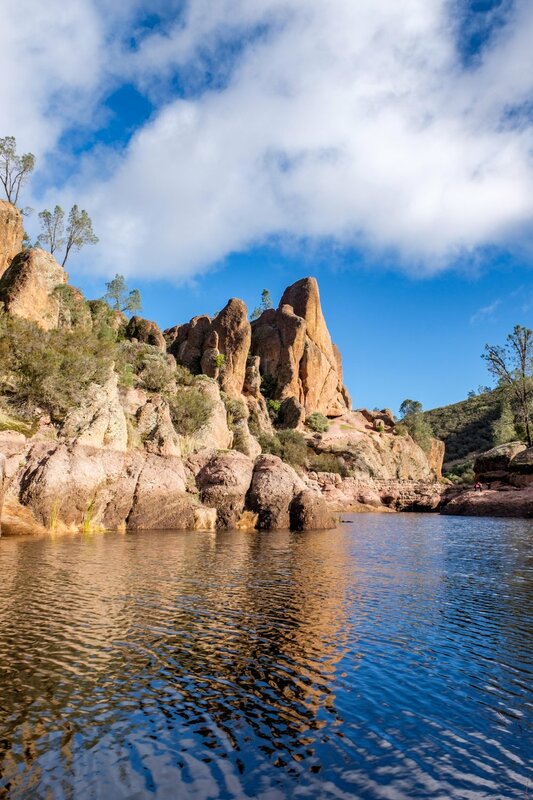 Pinnacles National Park is sweltering hot in the summer, making spring and fall the most desirable time to visit. Wildflower blooms are a popular attraction in the park and are visible along the trails during the springtime. 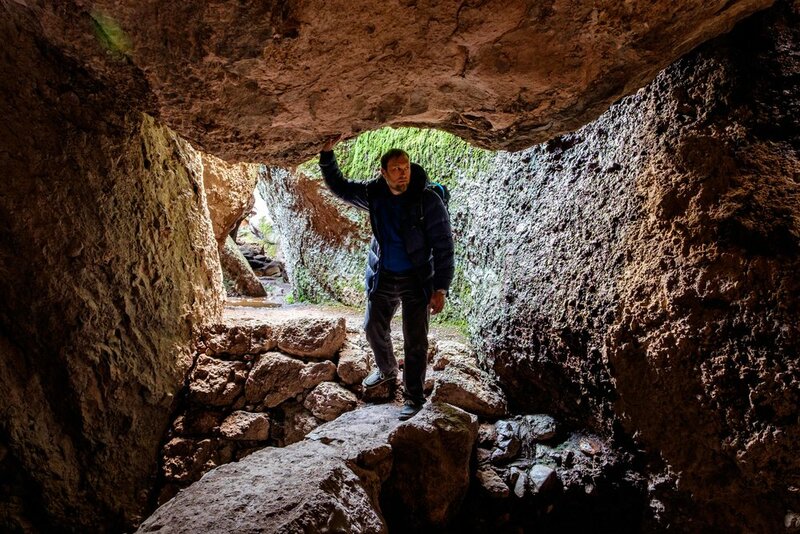 A couple of tips for explorers heading to Pinnacles to experience the talus caves: They are closed between mid-May through mid-July when bats are breeding, and headlamps are required. Can’t make it to the Mediterranean? 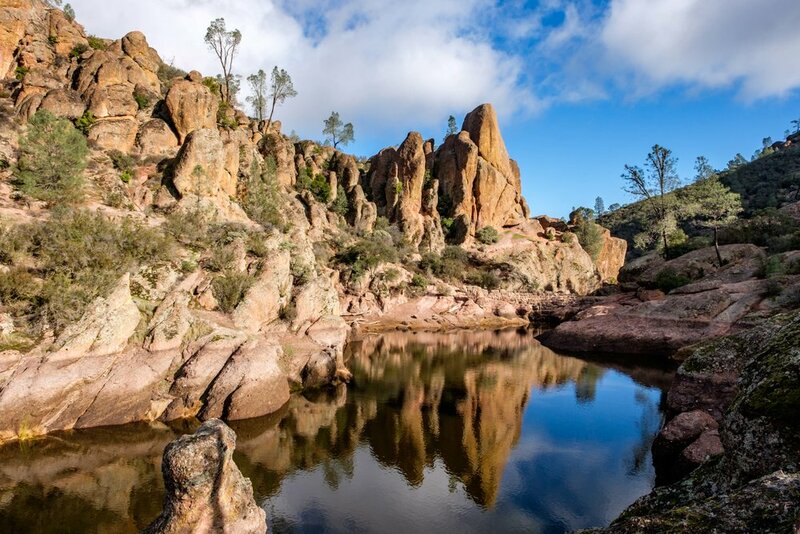 The climate at Pinnacles practically mirrors it; with moderate rainfall, mild highs and cold lows in the winter, and scorching hot days and cool nights in the summer. Elevation ranges in the area span from 824 feet above sea level and cap out at 3,304 feet. Native Americans once living in the region were from the Ohlone tribe – they were driven out in the early 19th century by the Spanish. Water sources and campsites were secured by President Calvin Coolidge after encouragement by the first Director of the National Park Service, Stephen Mather, who visited the area for the first time in 1924. Then Assistant Director Horace M. Albright appropriated funds to build the park’s first ranger cabin. Even though it was Theodore Roosevelt – the "Conservationist President" – who established Pinnacles as a National Monument, he never actually visited the area. 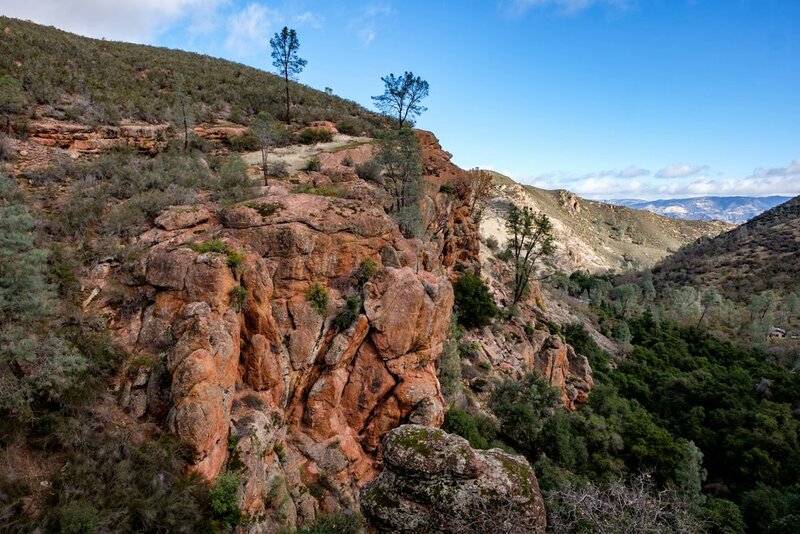 There are three information points in the park: The Pinnacles Visitor Center, the Bear Gulch Nature Center, and the West Pinnacles Visitor Contact Station – all can provide the information you need to make the most out of your park experience! 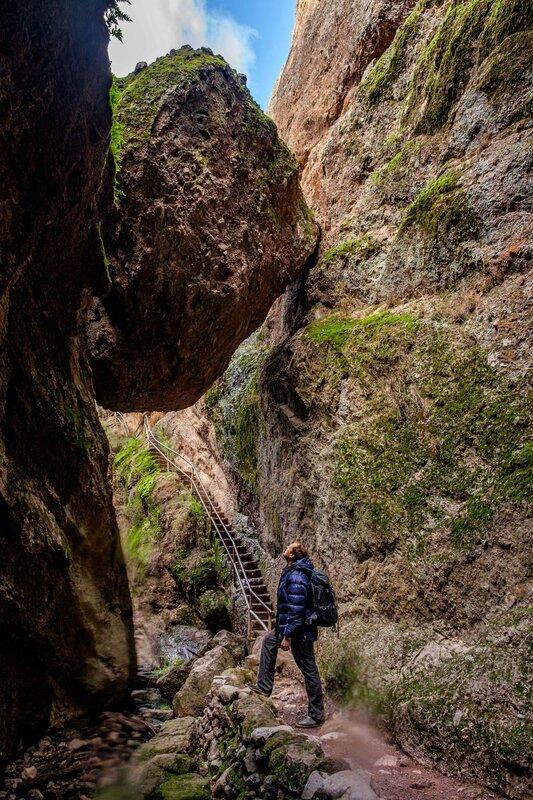 Pinnacles National Park welcomed 215,555 visitors during the centennial anniversary year of the U.S. National Park Service in 2016. 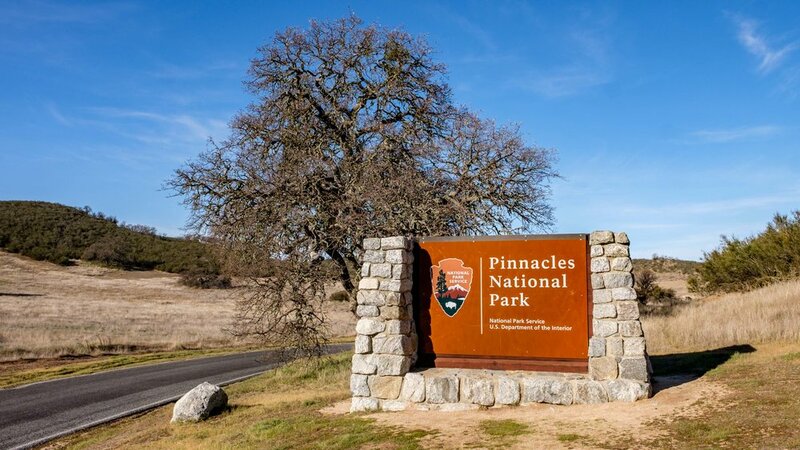 The entrance sign to America's newest national park: Pinnacles in the great state of California!